* Antidote starts with a mint blast frothing over citrus, lavender, and cardamom. It’s refreshing and spicy at the same time. * The top is kind of brisk, yet warms nicely. The scent seems to get stronger for the first two hours of wear. * The citrus fades away, but everything else stays in place. The mint, lavender, and cardamom are joined by a kitchen sink full of flowers and spice. It wears differently every time with cinnamon, allspice, and nutmeg in the spice mix and violets, rose, iris, and orange blossoms in the floral mix. Summary: You know the old Coco Chanel saying – before you leave the house, take a look in the mirror and take off one accessory. Antidote is the exact opposite – there are so many notes in the mix that it feels like they kept adding – but they are so well-blended that it doesn’t feel overworked (or overdone). 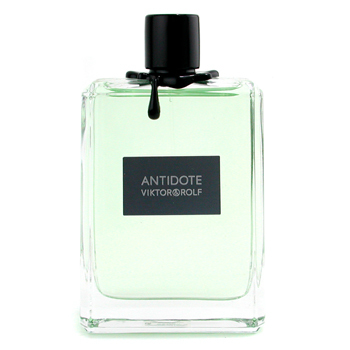 Antidote is young and brash in its concept, yet refined and mature in its execution. It’s that wonderful feeling of always discovering a different, new aspect, while the overall feel is comfortable and easy to wear. The projection is very nice throughout its twelve-hour plus life. You will catch whiffs of it without having to smell yourself, but it doesn’t broadcast loudly with massive projection. As a 2006 release, I would call Antidote a modern classic – an absolute masterpiece that will add a refined spark to any man’s fragrance wardrobe. I’ve never tried Antidote but I heard so many bad things about it that your review caught me by surprise. Of course, now I’m curious to try it.